Reducing radiation exposure is only half of the problem. Reducing and tracking radiation dose has become an area of emphasis in radiology, but performing those tasks efficiently can be challenging. Effective dose reduction and management requires a process that incorporates specific patient encounters with a patient's overall care timeline. As new standards for care, guidelines for accreditation, and regulatory rules come into play, that process will become increasingly important. "Patients don't typically have one scan in their life," says Tim Nicholson, senior manager of market development for the CT business unit at Toshiba America Medical Systems, Inc. "They have multiple scans, especially when there's a disease state, such as cancer; they're going to be scanned multiple times, so what's important is not only that you lower the dose for that specific scan but also the ability to track that dose over time." In terms of actually reducing the radiation dose that patients receive, manufacturers have used iterative reconstruction techniques, which can produce clear images from lower energy scans, to effectively reduce dose. Siemens Healthineers also uses tin filtering on several of its CT scanners, filtering out the parts of the X-ray beam that are less useful for generating images. An interesting attempt to further lower patient dose is under way at New York University (NYU) Langone Medical Center and Brigham and Women's Hospital in Boston. The two hospitals, in conjunction with Siemens, are building a prototype that attempts to lower the dose generated by a typical CT scan by 90%. The researchers are developing new software and hardware for the project. Daniel K. Sodickson, MD, PhD, a professor in the departments of radiology and neuroscience and physiology, vice chair of research in radiology, and director of the Center for Biomedical Imaging at NYU Langone Medical Center, and Ricardo Otazo, PhD, an associate professor in the department of radiology at NYU Langone Medical Center, received a $3 million grant from the National Institutes of Health to get the effort off the ground. The software is based on compressed sensing algorithms, which are beginning to be adopted in wireless communications, photography, and other medical imaging modalities such as MRI. Rather than using all of the data that are generated by a typical CT scan, compressed sensing uses only a subset of the data to create an image. Otazo says this is similar to what happens when an image is compressed by a cell phone. "Compressed sensing is based on the idea that images are compressible," Otazo says. "The full CT image that you're going to get is usually compressible, so why do we need to give all of this radiation to the patient if, at the end, we only need about 10% of the original data set?" Where iterative reconstruction can generate an image with lower X-ray intensities, the researchers intend to reduce dose by using high-intensity X-rays but blocking the ones they don't need. This will require new scanner hardware. "What we're proposing is actually to build a new collimator, and we're calling it a moving multislit collimator," Otazo says. "We are going to have narrow slits, and only the X-rays that go through these narrow slits will reach the patient, whereas all of the other X-rays will be blocked. And also, while the gantry is rotating, this collimator will move linearly, and we can move it in a random fashion." "If we're missing large, adjacent chunks of the data, we can't recover that," Sodickson says. "But you can imagine that if you are missing random bits here and there, you can unscramble that information. That's what compressed sensing does; it unscrambles information that has been undersampled in this incoherent or quasi-random fashion." Using this method, data will be acquired from a small fraction of the angles that typical reconstruction methods use, significantly reducing patients' radiation exposure. The data will then be uncompressed and used to form a medically useful image. In much the same way that a Pointillist picture looks like a bunch of dots up close but increases in resolution as the viewer moves away from it, compressed sensing allows the software to construct a picture from fewer data points. "Basically, compressed sensing is doing what the brain is doing," Sodickson says. "The brain is, essentially, reconstructing the full image and filling in the gaps. Likewise, the compressed sensing algorithm, in this way, is filling in the gaps, but it's filling in the gaps in a way that is quantitatively correct. It's not just a qualitative impression; the amazing thing is it actually gets the numbers right, too." The researchers are running simulations to determine what the collimator will actually do. They are in the process of building the hardware and hope to have a prototype ready in the coming months. It will take some time before the system is ready to try on patients. While technological advancements have assisted with dose reduction, and the DICOM Structured Report standard has made dose reporting uniform, vendors say many of their clients still need assistance with dose management. Staff turnover, nonstandard imaging protocols, and regulatory uncertainty are just a few of the hurdles; organizing the sheer volume of data is often the first stumbling block. "When you look at all of these data—people use the term 'big data,' which is truly what it is—people are overwhelmed," says Dominic Siewko, former radiation safety officer for Philips Healthcare and clinical marketing manager for the DoseWise radiation dose tracking solution. "So we realized that what we have to do is give people the data in small doses and say, 'Let's start small. Let's look at your biggest outlier and see if we can improve that.'" Improving care processes will require health care organizations to meet several challenges. A significant challenge is protocol management. Siewko says a lack of protocol standardization often leads to variations in dose reporting. For example, a pediatric patient may receive a scaled-down version of an adult CT scan, rather than a scan that was optimized for pediatric patients, or a technologist may perform a chest/abdomen CT because a particular scanner doesn't have a specific chest CT protocol. Christine Ziemba-Landon, CT product manager at Siemens, says the ability to quickly update protocols is important for standardized dose tracking. "There may be multiple facilities within an organization. There could be the main campus and a lot of outliers, but how they manage dose and manage their patients comes with protocol management," Ziemba-Landon says. "If there's a protocol that's developed at one of the main campuses that's an amazing protocol, then that protocol can be pushed to one of the other organizations within the system so they are all doing the same types of imaging dose reduction strategy." Another challenge is equipment age. Ziemba-Landon says some machines may be in use for seven to 10 years. Reducing dose within the means of those products requires communication with vendors. Education of staff is also important. "Other things that may affect the dynamics in dose reduction are that the staff may change," Ziemba-Landon says. "That can affect the product's performance in terms of whether they are using the dose reduction strategies that are implemented within the system. Some of it can be a lack of knowledge of new staff." Patient education is important, as well. As patients become more involved in their health care decisions, they are taking a closer look at radiation dose. Nicholson says health care providers will need to adjust to this trend. "Their customers are patients, and patients are really consumers of health care now so they have a choice about where they're going to get their scans, how much they're going to pay for them, why the exam is necessary, etc," Nicholson says. "When patients schedule these studies, these are the questions they ask the providers." Patients want to know that they're getting the best quality care at a fair price. Effectively managing dose data can drive quality improvement and ensure continuity of care, says Melissa Priestley, MPA, product manager for dose management at GE Healthcare. She says continuity of care will become a bigger challenge as more health care systems consolidate, especially as more providers employ multivendor fleets. "I think what it really comes down to is how do you ensure that, no matter where your patient goes within your network, you're delivering consistent quality of care," Priestley says. "So whether they're at your facility in California or your facility in Colorado, how do you ensure that the practice is consistent?" Each of the large medical imaging device manufacturers has products that reduce and track dose. On the dose management side, GE has DoseWatch, which it advertises as vendor neutral, multimodality, and patient centric. Philips has the DoseWise Portal, which it describes as a multivendor and multimodality software radiation management solution. Siemens has teamplay, which is a cloud-based software that allows users to monitor dose and protocols. Toshiba has a suite of products that monitor dose and manage protocols. These types of solutions will become increasingly necessary as more states and accrediting bodies move to monitor radiation dose more closely. The United States' efforts have mostly been driven by individual states, but Priestley says new rules, such as Washington's specifying exact limits on CT Dose Index volumes for pediatric and adult protocols, could influence additional states or the federal government. "This is an evolving market challenge, and it will be really interesting to see in the next couple of years whether it will continue to be driven statewide or if there will be more of a governmentwide focus on it," Priestley says. "Also, The Joint Commission has revised requirements for diagnostic imaging services including reporting a patient's CT dose index, verifying testing parameters, and guidelines for creating/revising protocols. Dose management solutions provide the quality data, insights, and reporting needed for health care providers to manage these types of accreditation requirements." Siewko says regulations such as the Centers for Medicare & Medicaid Services' requirement that all CT scanners used for Medicare outpatient exams adhere to NEMA's XR-29 standard will likely become more common. The industry is still in the benchmarking phase, he says, but initiatives like the ACR's Dose Registry Index are laying the groundwork for more effective dose management. 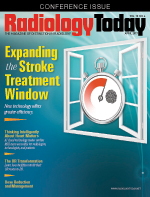 "There's really the potential for radiology to learn and to standardize and to do better with managing dose," Siewko says. "It's coming faster, I think, than customers expected."